This is a highly entertaining and informative read, required reading for anyone with an interest in the 'Raj'. The book is taken from a BBC radio production which was based on oral histories from those who actually lived and worked in the final days of Imperial Raj. As such, it benefits from wonderfully incisive and evocative accounts, full of the rich accounts of the ordinary, and extra-ordinary, snippets of real people's lives. However, this oral tradition also provides some of the ammunition that might be levelled against this book as being a rather muted collection of nostaligic reminescinces of a bygone era. Indeed, the contributors do sometimes lapse into sentimentalism and see their role in India through somewhat rose tinted glasses. In addition, this book presents a very upper middle class view of the world, but then again most Anglo-Indians were drawn from this very class and I think that it is worth allowing these individuals their nostalgia in return for their highly illuminating and informative anecdotes about a period of history that is slipping quickly from human experience and memory. The book is organised into chapters that would be quickly identified and understood by most Anglo-Indians; the club, the weather, the children, the hill stations, the frontier... Being part of the ruling elite, pretty much all Europeans would have been part of this wider community. The only real exceptions to this club were the soldiers (that is to say privates and NCO's) and missionaries who both fell foul of the necessary social etiquettes. The book, however does not allow these exceptions to fall from its pages, and dedicates a fair few chapters to their experiences and exploits. As for the ruling elite, the book goes into some detail as to what motivated them to leave Britain for this inhospitable country; whether they were drawn by the tales of Kipling, for money, they were expected to follow family tradition or that they were drawn purely for the action and adventure. For whatever reason, thousands upon thousand of Britons made their home in this part of the world. And, for whatever reason that they may have made their way to India, they all had to make sacrifices of some sort or other. The book is full of accounts of mothers sending their children half way across the world to go to school and wouldn't see them for years at an end; of housewives having to deal with insects the size of tennis balls and of snakes in the nursery; of death and disease visiting this wealthy elite as much as the poorest of their subjects; and of boredom and loneliness in the furthest flung corners of this vast sub-continent. But, to counterbalance these sacrifices, there were opportunities aplenty, the most obvious being that people could live a lifestyle in India that they could only have dreamt about back in their home country; servants, nurses and maids did every conceivable chore for these imperialists. Everything was bigger, taller, vaster than it could possibly have been back at home; their world and existence was as much filled with the magic and the exotic of life as it was with isolation and drudgery. Of course, the contradictions of imperialism also creep into the accounts. These people were often the most liberal, highly educated people on the planet and yet were part of a ruthless and oppressive regime. 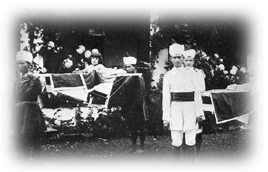 These contradictions are often revealed quite by accident by the contributors, such as when one man tells how the subject of Indian membership to clubs almost 'split the empire' and another saying that they went to the clubs to relax with their 'own sort'; or the officer who, when talking about playing polo, mentioned that they would even play with 'an Indian superintendent policeman if one couldn't make up the numbers.' This very subtle racism permeates the book, but it is still interesting to read about it and it will certainly help you to understand the mindset of those who were called upon to rule this great centre of the empire. Actually, even when the book begins to present the winding up of the 'Raj' you get interesting hints of the mismatch between what these people perceived to be Indian attitudes towards the empire and the actual events that were taking place. What these people want to say is that they did their best and that the Indians respected them for it, but then you keep reading of Europeans being attacked, stoned and even murdered. There is a nurse saying that 'It was very comforting to see the Union Jack flying and of soldiers on the parapet. '; or of the woman who finds out that her servant is actually a murderer. The book is, quite accidentally I'm sure, good at pointing out the discrepancy between what the 'Anglo-Indians' wanted to be happening and what was actually happening. Sometimes, the evidence is not quite so well concealed: 'At times I feel like chucking it and taking my first pension. Living in a country in which, through no fault of one's own, one is hated, has few attractions and the future will probably deny what little status we have at present.' It is insights such as these that make this a valuable book to read. The book is part of a series; joining one on South East Asia and Africa. Possibly because it was the first of the series, it feels fresher and more informative than the its sister volumes. All in all, I enjoyed this book and have taken a lot from it, perhaps more than the contributors and author expected.